We have a buffalo chicken addiction. Among many others things. Like red wine, chipotle peppers, Thai food and big, juicy burgers. My mouth is watering just thinking about any and all of those things. Another thing I can’t get enough of? Poutine. Do you blame me? You can’t call yourself Canadian if you haven’t had poutine. And yes, I’m talking to my mother, who has never tried it. She’s a crazy person, clearly. 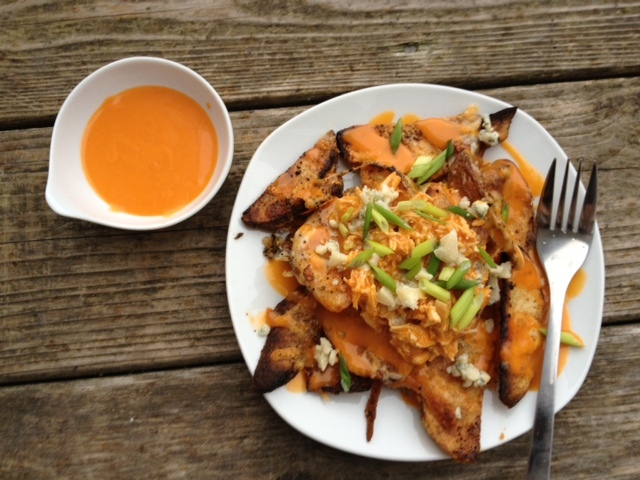 So what do you get when you mix a buffalo chicken addiction with a poutine addiction? Buffalo chicken fries. That’s what. I dare you to offer me something more delicious than this for supper tonight. It’s impossible. Now, before I share the recipe, I want you to know that I hate mushy, soggy fries. In my opinion, fries HAVE to be crispy – really crispy. Heavy on the crunch, easy on the potato. That’s how I like it and that’s exactly how these fries are. I read that the trick to crunchiness is parboiling the potatoes first. It’s a bit more work, but it’s worth it. Preheat oven to 450 degrees. Boil potato wedges for just five minutes. Drain and cool with cold water. Coat potatoes with oil, salt, pepper and garlic powder and place on greased baking sheet. Bake for 30 minutes, flip, and bake for another 30 minutes. Potato wedges should be crispy and golden. Meanwhile, heat buffalo sauce and margarine in a saucepan and stir. When potatoes are done, group them in the centre of the baking sheet and drizzle a bit of sauce over them. Top with both cheeses (if using). Broil on high, keeping a close eye on them, until the cheese is melted and golden. Mix shredded chicken in with remaining buffalo sauce. Top potatoes with this chicken mixture, a bit more cheese and green onions. Note: These can totally be made without the chicken. Just as good. OMG they really are. Just be sure to par-boil the potatoes. More work but it’s 100% worth it!